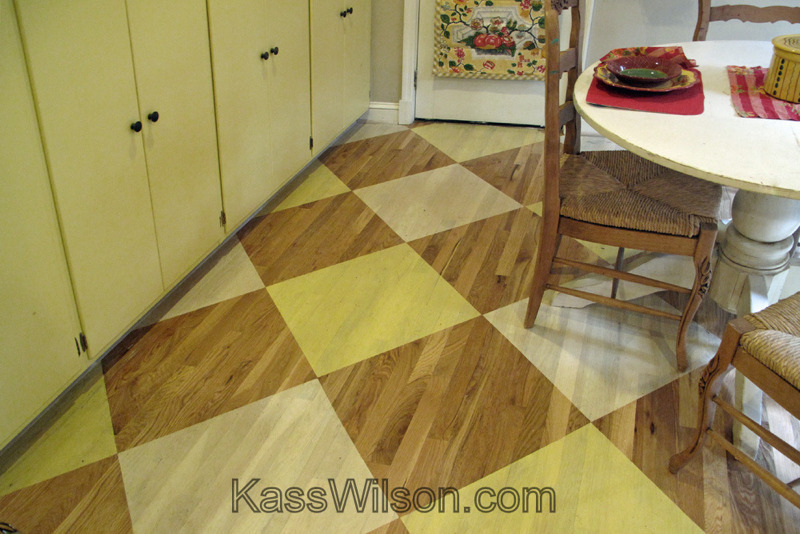 When Life Gives You Lemons, paint your floor! It can happen when you least expect it… a broken pipe sends water all over your hardwood floors and they need to be replaced. So, when life gives you lemons, you make lemonade. 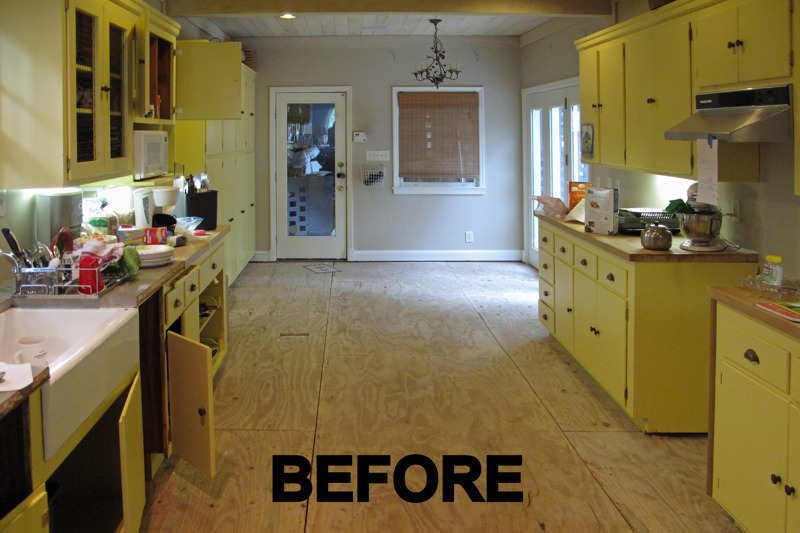 This client viewed the tragedy as an opportunity to do something new and unexpected by painting her floors. 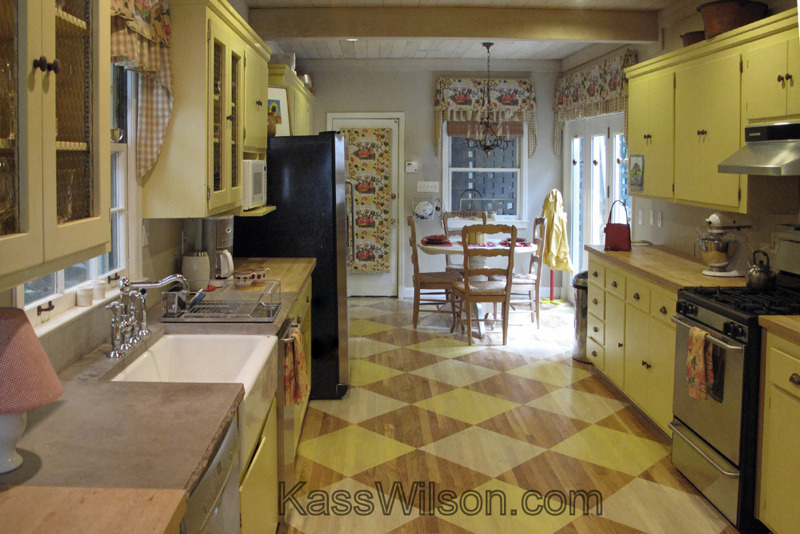 This vintage kitchen was very long and narrow… like a long tunnel. The direction of the hardwood planks emphasized this even more. Introducing a pattern on the floor broke up these long lines and made it appear cozy. Squares are consistent with the charming country décor. But for an updated look, they were placed in a diagonal pattern. The initial planning phase is similar to laying tile. . . Identify the critical site lines and focal points and then build the pattern outward. 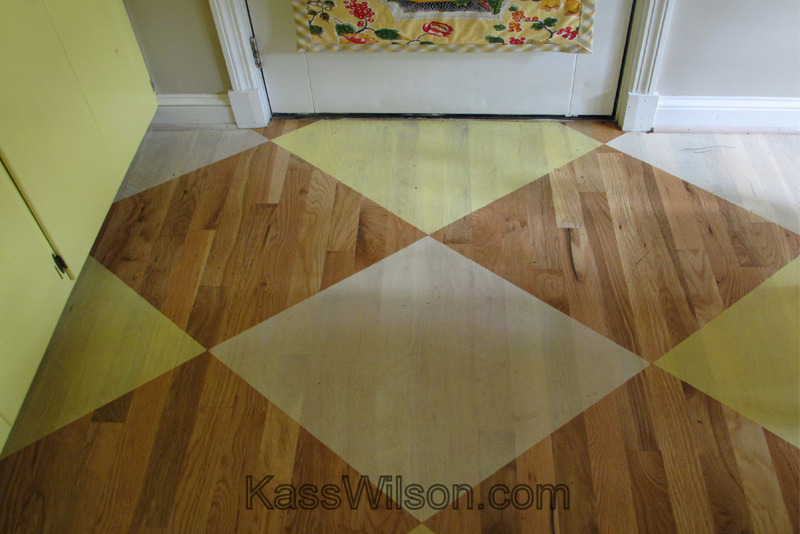 One advantage with paint and stain is that the squares can become any size needed to make them fit perfectly and line up with the symmetry of the space. 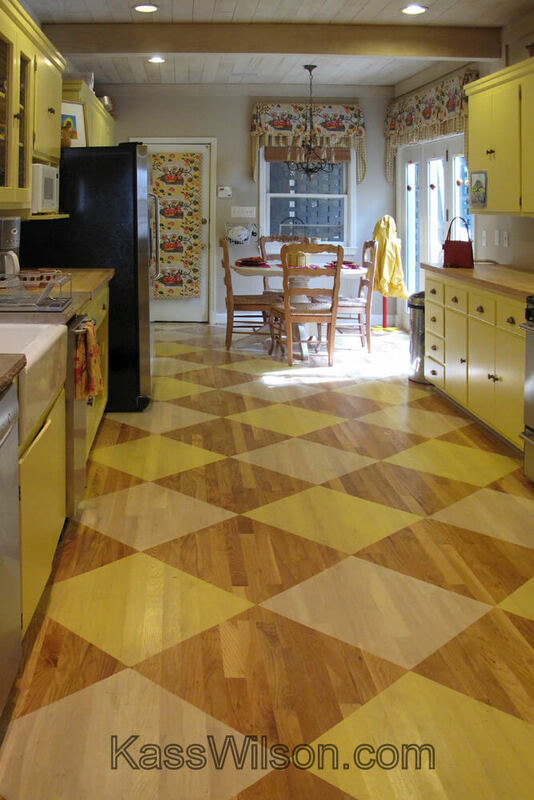 Custom stains were used on this floor instead of paint which allowed the natural grain of the wood to show through. 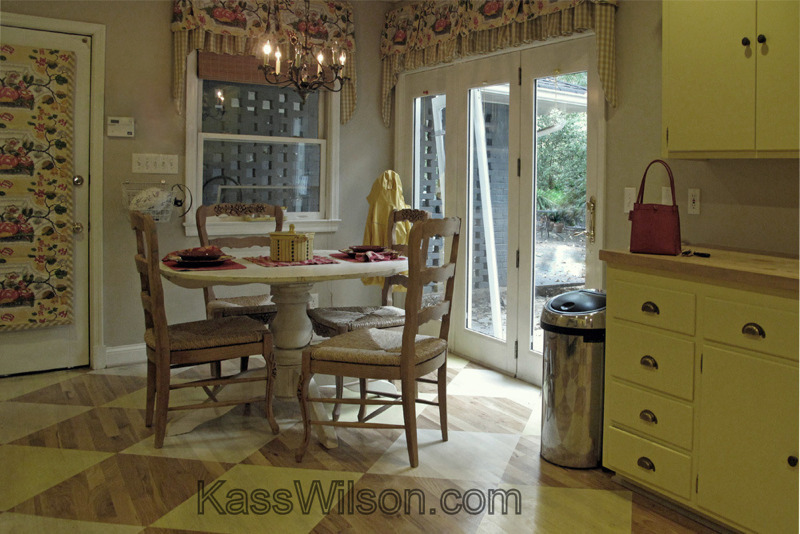 The colors were inspired by the cabinets, the trim and butcher block counters. Once completed, all topcoats were applied by Andrew Chadwick, (www.Customremodeling.com ). This ensures that it will be durable for a complete active family. They are very glad to have their kitchen back. It is now a cheerful place to enjoy a tall glass of lemonade. Wouldn’t you like to join us? Please let us know with your comments below. Thank you. Kass Wilson, owner of WallsTreat Studios, works with the industry’s best interior designers as a consultant for the design team. Her expertise offers creative options that will transform surfaces within any space. Feel free to contact Kass Wilson for innovative solutions to some of the most challenging interior design and decorating dilemmas. WallsTreat Studios is proud to be recognized for award winning artistic faux finishes and decorative artistry. I love that!! You did an awesome job. Great job! I love it. So creative, so beautiful, so right for the space. Thanks for sharing your lovely work. Another amazing transformation by Kass! I am continually impressed! Beautiful. 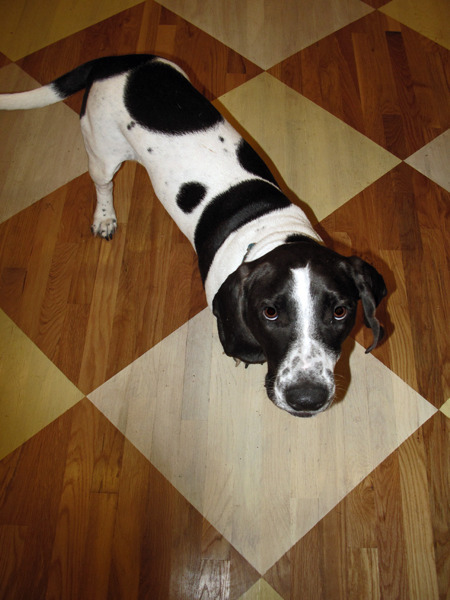 I have newly stained hardwood floors and would like to add this same effect. 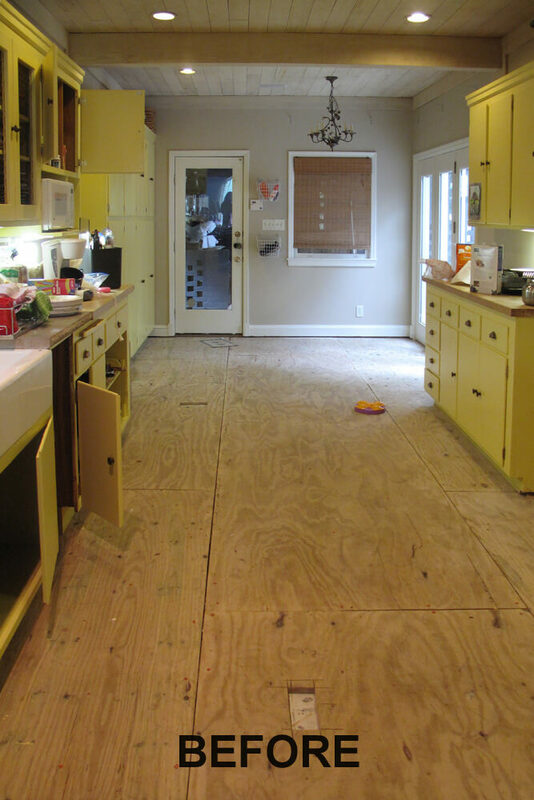 Can the design be added without re-sanding the floors?